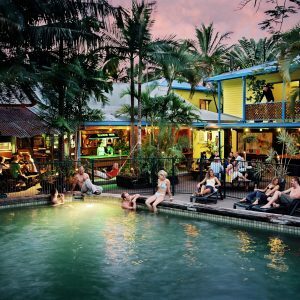 4 nights accommodation in a Gilligans 8 bed dorm and your choice of any Partyincairns.com pub crawl on a Mon, Wed or Fri night. Located in the heart of Far North Queensland we specially designed the resort for you to come GET STRANDED in a place you will never want to leave. We are a place that every traveller should have on their bucketlist, with state of the art facilities, superior comfort and friendly services – Gilligan’s is a millennial revolution in beds, nightclubs, events, dining, gaming, travel and much more. We have created an experience to entertain you from morning to night. 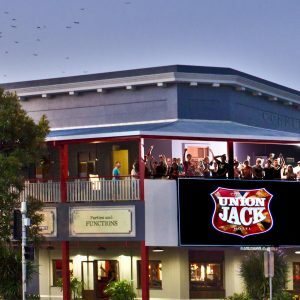 Centrally located in the city of Cairns, we are right next door to Rustys Market surrounded by various shops, cafés and clubs and the cinema – making Gilligan’s the ultimate location for everything you need. Aside from offering traditional dorm style, air-conditioned, en-suite accommodation Gilligan’s also has deluxe dorms, plus modern, stylish twin and king hotel rooms. These are located on levels three and four to ensure a quieter nights sleep for those looking for some extra relaxation. But rest assured all room types, including our dorms have private en-suite bathroom facilities, a completely luxe style backpackers resort! Our facilities and services are endless, including free airport pickup, 24 hour reception and security, free Wi- Fi for your social needs, unisex fitness centre, a ladies powder room, four quality kitchens and a massive pristine lagoon swimming pool right by our Deck Bar for all your hydration needs. Stay with us to become one of our matey’s and we will help you save money. We provide a meal each night for just $5.00 and VIP pricing throughout our entertainment venues and events – getting home is as easy as walking back upstairs. Our entertainment venues…….about that! Did you know we are World famous for what we do in the World of entertaining people who come from all over the planet to experience us. From The Annual Sinners Ball to our party nights we have put in a lot of work to create your best night out and the party experiences of a lifetime. We bring all the biggest acts from far and wide and put on a show like you have never seen before. Be sure to check out what is coming up and the memories we are creating with people nightly – see our socials to get the minute by minute updates.